Washington is inundated with deficit commissions. 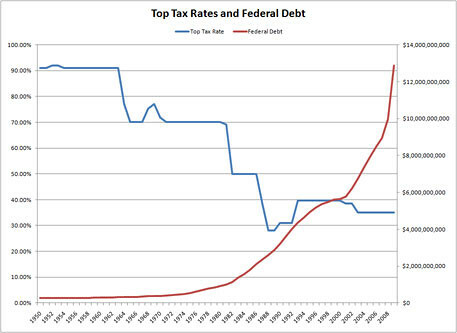 The country has piled up a huge debt because we cut taxes for the wealthy and borrowed to make up the difference. But everyone says we can’t fix the problem by raising taxes on the rich in a recession because taxes “take money out of the economy.” Is there a factual basis for this idea, or is it just one more corporate/conservative-generated piece of “conventional wisdom” bamboozlement? A brief budget history since the 80’s: We cut taxes, increased military spending and cut investment in our infrastructure, and the result was huge budget deficits and slower economic growth. Then in the 90’s we raised taxes on the rich and increased investment in the country and we had big budget surpluses and the economy was growing at a good clip. Then in the 00’s we again cut taxes on the rich and raised military spending and cut back on investing in the country, and went back to huge deficits (“incredibly positive news”) and feeble economic growth culminating in the financial crash. So now, to address the Reagan/Bush deficits the DC elites — the “serious people” — are proposing … wait for it … not raising taxes on the rich, not cutting military spending and not investing in the country. Instead they want to cut back more on the safety net and on services for the middle class. There really is a brain disease loose in DC. The justification for DC’s refusal to fix a problem caused by tax cuts on the rich by restoring taxes on the rich is that you can’t raise taxes on the rich during a recession. The oft-repeated idea that taxes “take money out of the economy” has become so ingrained that there is no discussion at all, it is just accepted as a given. It is “conventional wisdom.” It certainly is a convenient conventional wisdom for the wealthy, but it is a fact? Let’s look at some counter-arguments. 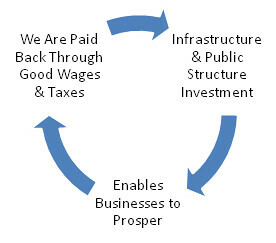 2) Taxes bring in revenue to pay for improvements in infrastructure that cause the economy to grow. Investing in modern transit systems, smart grid, energy efficiency, fast internet and other improvements leads to a huge payoff. 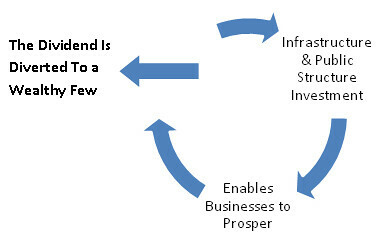 Infrastructure improvement and maintenance is the “seed corn” of economic growth. We have been eating that seed corn since Reagan’s tax cuts. Some might argue that we can just borrow to invest in infrastructure — but we don’t. One result of the Reagan tax cuts was a cutback in infrastructure investment, which is dissed as “government spending.” (For some reason the same borrowing to spend on tax cuts is not dissed.) After 30 years of Reaganomics our infrastructure has fallen behind and we are not competitive in the world economy. 3) Taxes on the rich redistribute money back into the economy. This gives more people more money to spend, which helps a consumer-driven economy to grow. Today, the richest 1 percent account for 24 percent of the nation’s income. 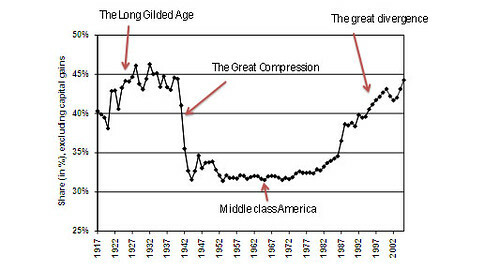 … from 1980 to 2005, more than 80 percent of total increase in Americans’ income went to the top 1 percent. Currently a few people receive most of the income and own most of everything. A very high top tax rate reduces this concentration of wealth. 4) Historically, high tax rates are associated with increased economic growth. It is for others to say whether this correlation is causation, but cutting taxes has certainly not been associated with increasing growth. Conclusion: Raising taxes on the rich will not slow the economy. In fact, every indication is that tax cuts on the rich might hurt the economy. So the real question is, why aren’t these “deficit commissions” proposing that we fix a deficit problem that was caused by tax cuts for the rich by raising taxes on the rich back to where they were before the problem? It is clearly time to stop the “riverboat gamble” and restore pre-Reagan top tax rates. 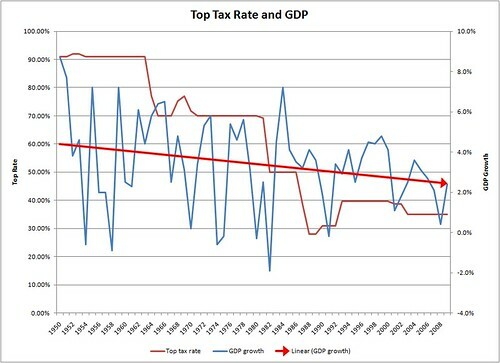 Update – After posting I came across this from David Leonhart in today’s NYTimes, Were the Bush Tax Cuts Good for Growth? Those tax cuts passed in 2001 amid big promises about what they would do for the economy. What followed? 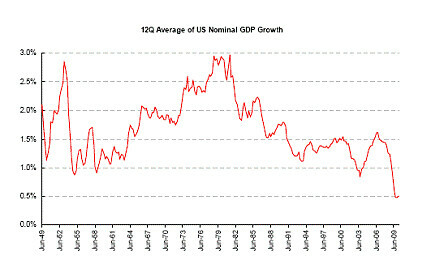 The decade with the slowest average annual growth since World War II. Amazingly, that statement is true even if you forget about the Great Recession and simply look at 2001-7. Exactly. Leonhart says the right’s case is a strong one, “When people are allowed to keep more of each dollar they earn, they are likely to work longer and harder.” Actually, you would think people who were taking home a bit less would work longer and harder to make up the difference, wouldn’t you? The Ayn Randian idea that people stop working if they have to pay taxes might apply to the very, very, very (very) rich, but the rest of us have to pay the bills. And so does our democracy. Anyway, you can solve the conflict by looking at what actually happens, which he did, and what happens is that tax cuts and a slow economy go together every time.